The legendary Danelectro guitars are now at Sims Music! Danelectro guitars are known for their style, value, the introduction of the baritone guitar, and of course being played by some of the best guitar players in the world like Jimmy Page! Nathan Daniel worked at Epiphone while also independently making his own amps in the early 1940s. In 1946, Daniel left Epiphone and had his first large scale production deal with Sears and Montgomery Ward making amps for their respective brands. Working out of New York, he created the first push-pull circuit, which made the amps far more reliable than others at the time. Nathan Daniel was at the forefront of amplifier innovation and experimented with tremolo, reverb, and hybrid power systems at very early stages. These early amps have aged surprisingly well, and have become cult classics since being adopted by players like Jack White and Dan Auerbach. In 1954, Daniel decided to introduce a line of electric guitars that avoided any resemblance to the familiar acoustic guitars of the time. Daniel constantly tinkered to build better, more affordable electric guitars leading him to experiment with metal neck reinforcement. He also cut costs and eased construction by using metal nuts, and he pioneered the neck micro–tilt adjustment before Fender came up with his own design. In addition to these innovations, Danelectro guitars were made with the now famous "lipstick pickup". Danelectro’s business model selling cheap, great–sounding guitars - as well as his amplifiers - led to Danelectro becoming one of the earlier electric guitar mass producers. Though the mainstream popularity has slowed down a bit, Danelectro guitars still retain their iconic sound, look, and affordability. They are still sold all around the world, and most recently, Sims Music! Here are a few of the models we have in the store! The D59M NOS+ has a spruce top and frame and triangle sound hole make this baby sing! ’56 Lipstick® pickups for authentic 1950’s Danelectro® tone. A treat to eyes and ears! First made in 1958, this squawky short scale bass is loved for its distinctive sound and can be heard on countless recordings. Danelectro’s best sounding 12 string ever! 3 Hot Vintage colors, “S” Sound Hole, and ‘56 Vintage pickups make this a “must have” guitar for any player! 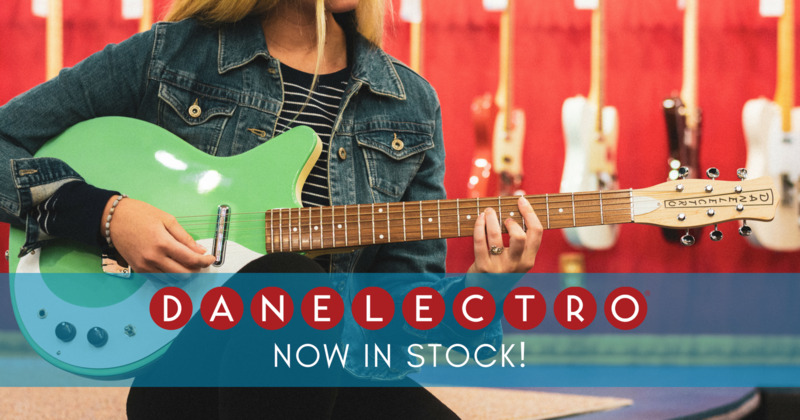 Click here to see our full stock of Danelectro guitars!